Siglent Technologies manufactures two families of handheld, battery-operated oscilloscopes; the SHS800 and SHS1000 families. Although the two families appear to be identical (except for the case color), they have several differences that may, or may not, affect your choice. From the description above we can see that SHS1000 employs both the “floating” and “isolation” concepts, but the SHS800 does not. The traditional oscilloscopes are the structure shown in the right figure. 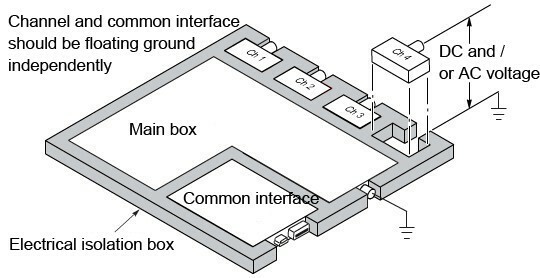 In this structure, in multi-channel measurements, all the input signals must have the same voltage reference, and the shared default reference is the “earth”. If there is no differential preamplifier or external signal isolator, this traditional desktop oscilloscope is not suitable for floating measurements. There is no real ground reference level of a handheld oscilloscope. As shown above, the ground reference for the various modules belongs to virtual ground, and the reference voltage of the oscilloscope channel directly relies on the input voltage of the probe’s clip. CAT II 1000 V can withstand instantaneous high-voltage 6000 V. Although the SHS800 is lacking in channel isolation, it does have high overvoltage level CAT II 1000 V. This scope also features vertical sensitivity from 2 mv/div to 100 v/div.